The home is beautifully decorated with quality furnishings yet is very comfortable. There are two bedrooms and two full baths in the main house. Both bedrooms have views toward the river. The master bedroom has a queen-size bed, and the second bedroom has two twin beds. The living area has a spacious feel, with the kitchen separated from the dining area and living room by a couple of counters. There is a dishwasher, electric range and oven, and lots of quality cookware and serving ware. The dining area has a table that seats six comfortably and peaceful views of the woods and river. A breakfast nook off the dining area seats two. Adjoining the dining area is the living room, which has comfortable leather couches arranged around the wood stove/fireplace. There is a television with VCR, DVD/CD player, satellite television, and a small stereo system. For extra privacy, some members of your group may want to settle into the cozy guest house that has two twin beds as well as a fold out couch (double-bed size) and a half bath. There is a small television and VCR. The main house has decks along the back and sides, with plenty of porch furniture and a high-quality gas grill for your outdoor meals. There is also a hot tub for your enjoyment! There is much to do nearby! Paradise Valley offers a wealth of outdoor recreational opportunities, including fishing, hiking, biking, horseback riding, rafting, and winter sports. It is a short drive to the restaurants and galleries of Livingston, to the legendary Chico Hot Springs, and to Yellowstone National Park and adjacent national forests. 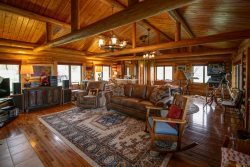 - Located only a few yards from the Yellowstone River with fishing access! This is a lovely home with all the comforts you need. The bubbling sound of the river and the birds, deer, cow and other friends makes for a serene environment. The location is terrific - near to town but also the gateway to Yellowstone. We visited in late September for a wedding and while there was a chilly spell the valley had better weather than surrounding locations. It's very magical and special. The home has a very well-appointed kitchen, nice views, and everything you need. We hope to return! We thoroughly enjoyed our stay - it was a prefect location for accessing the Gallatn and Yelowstone areas, but also easy into Livingstone too. The accommodation was comfortable and well kept. We had a very relaxing time there. Great house that is clean and well equipped, the pictures are accurate and the location is great. The river running right by the beautiful deck was very nice. We are making plans to return next summer. This house is lovely, with plenty of room for a family. Great location near the Yellowstone River and Pine Creek. Convenient access to the Park and to Livingstone. Love the sounds of birds, and rushing water! Very peaceful.